Light, fine gauge and in a seven pair pack, these Jeff Banks Plain Cotton Trainer Socks are a superb deal for both the daily gym-goer and the man who likes to follow the ‘no-socks’ look - a fresh pair of socks for every single day of the week! Jeff Banks Plain Cotton Trainer Socks are made with a soft, high cotton rich fibre blend that creates smooth, easy to wear socks. 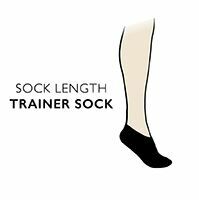 These trainer socks are non-cushioned, so they carry no excess bulk or weight to slow your training down, or cause tightness in close-fitting shoes. The pack is single colour, so no problems with matching the pairs up on wash day either!